Skateboarding just got a little easier in Hailey. Completion of a $187,000 expansion to the city's world-class skatepark brought new terrain that will allow for beginner and intermediate skaters to get in on the act. The new terrain is a tribute to skateboarding's urban heritage, with some rural Idaho twists. It took Oregon-based Dreamland Skateparks less than two months to lay foundations, tie rebar, and pour and smooth hundreds of yards of concrete within the expansion. The construction crew was made up of avid skaters, some of whom have skated and built parks around the world. The "street-skating" elements added at the Hailey Skatepark include stairs, handrails and bricks, many of the things a skater in the old days would have ridden in a city, oftentimes illegally. Some of the vertical slabs are made from actual concrete highway dividers. "These are the things that kids would have skated before there were skateparks," said 34-year-old Tavita Scanlan, a veteran skateboarder who has worked for Dreamland Skateparks since 1999. Scanlan has helped to design and build more than 60 skateparks around the country and around the world. He joined the company in his hometown of Lincoln City, Ore., where Dreamland was building one of its first parks. "The company was just forming," he said. "We had all worked on renegade projects, patching cement in abandoned pools or building ramps. There are only a handful of skater-built companies. Skaters have a real eye for what works at a skatepark." Scanlan said skateboarding has changed since he first picked up a board 24 years ago. "It's become really cool in the public eye," he said. "The designs have changed, too. Parks were a lot more flowy back in the 1970s." Terrain these days is more focused on short bursts of creativity and daring. Scanlan explained that the design of "bowls" with vertical walls at the original Hailey skatepark, also built by Dreamland about 10 years ago, is reminiscent of the empty swimming pools that skateboarders rode in the early days of the sport. He points to the top of the full-pipe section, from which advanced skaters launch into the bowl at the original park 100 feet away. "There are not many places that you can get that kind of speed dropping in," he said. "This is still one of the best parks, period." Scanlan said Dreamland skateparks owner Mark Scott met regularly with local skaters to get input on the design of the park, even as it was being built. Locals gave input into the number of stairs at the park, the level of handrails and other designs details. Skaters a generation ago simply took whatever hard surfaces they found in their hometown and skated them. Scanlan said the rebellious reputation that skaters have acquired comes in large part from the fact that skating at many desirable sites was once against the law. "If we were climbing into someone's backyard to poach a swimming pool or riding the handrails at a city hall building, usually it was illegal. It's private property if you are sneaking into a pool, and cities worry about liability issues or noise," Scanlan said. "Skateparks definitely made it easier to get into skateboarding. Now they call it a sport. I still have a hard time calling it a sport." The design and construction of Hailey's skatepark expansion is certainly an art. Round contours flow into vertical sections. "Kinks" or angles occur right where a skater would most appreciate them. 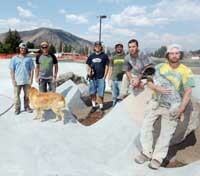 There are also large Idaho boulders incorporated into the Hailey skatepark, as well as trees and other landscaping that will remind skaters that they are far from the big city. "For example, you don't go when someone else is dropping in," he said. "There's a certain amount of mischief going on when you have kids around, but at least when you are here you are keeping busy at something. If they're into their spot, they'll protect it. You won't see as much graffitti." Scanlan and the rest of the Dreamland crew pulled out of town last week after smoothing the last sections of concrete and picking up their tools. "Skaters are the same all over the world," said Scanlon, who has built parks all over the United States and in Austria, England, Italy and Israel. "They all picked up a board with wheels on it and made use of the architecture in their cities and towns." Thanks to the Dreamland crew and Hailey taxpayers—who agreed to fund the project as part of a bond issue—Hailey's new generation of skaters have something to be proud of.